Manipal Hospitals Bengaluru has organized ‘You can save life anywhere’ campaign in the city to mark World Ambulance Day. Aimed at creating awareness and training people with life saving techniques, the event witnessed around 200 people participating in the MARS ambulance rally and training of CPR (Cardiopulmonary Resuscitation) and AED (Automated External Defibrillator). The campaign was flagged off by P. Harishekaran, Inspector General of Police and Additional Commissioner of Police (Traffic) and Shwetha R. Prasad, Kannada Actress in the presence of Dr. H Sudarshan Ballal, Chairman- Manipal Hospitals. The campaign kicked off with MARS ambulance rally, which started from Manipal Hospitals in order to spread the message of ‘Give Way Save a Life’ to public, followed by inauguration of the poster exhibition on life saving techniques and training session. The training programs included CPR (Cardiopulmonary Resuscitation) which is used to help people having sudden cardiac arrest and AED (Automated External Defibrillator) which is used to restore oxygenated blood flow to the vital organs. People can further avail these training programs by booking via the hospital’s website across all the hospitals of Manipal. Further, every second Saturday of the month have been dedicated to this training. The Hospital aims to train people in batches starting with admin staff of metro and malls in Bangalore, police, students, general public and gym instructors this year. 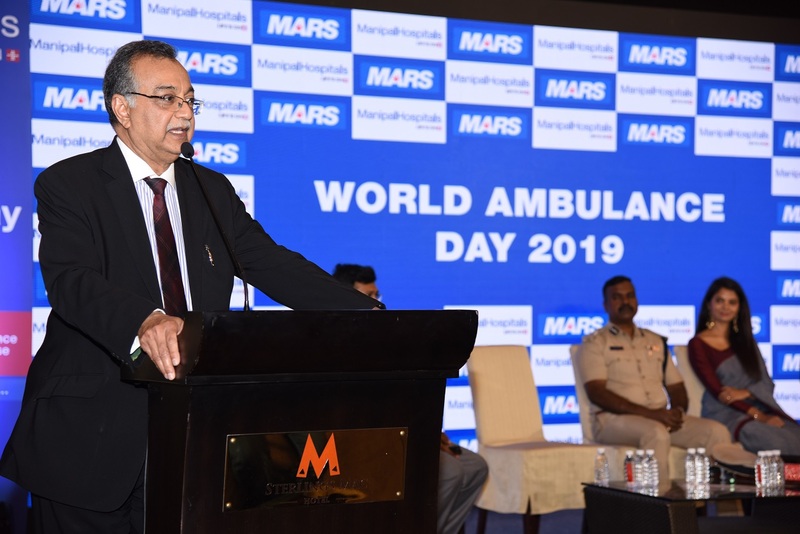 Manipal Ambulance Response Service (MARS) was launched in 2015 and since its inception, it has been ensuring the best outcomes in terms of saving lives and bringing smiles back on the faces of its patients and their loved ones. Enabled with GPS based live vehicle tracking system and equipped with critical lifesaving equipment’s, Manipal’s fleet of ambulance have saved 23984 lives until date. It is also equipped with Central Monitoring System, which relays images of patient condition direct to Emergency Response Centre. The state-of-the technology enables the ambulance to deal with any kind of crucial emergencies. Supporting the initiative Shwetha R Prasad, Kannada Actress said, “I am extremely delighted to be part of this great cause and appreciate each and every one of you. Manipal Hospitals’ ‘You can save life anywhere’ campaign is truly remarkable and I hope the message ‘Give Way Save a Life’ spreads to all the public.